I ordered the Navy rug set. They're exactly what I was hoping for as far as color and pattern but they're pretty lightweight. I would recommend getting a none skid rug pad for underneath. Great item for the price! These are very thin rugs. However, the colors are beautiful and the rugs seem to be holding up well in their dorm room application. The colors were just as I had hoped they would be. 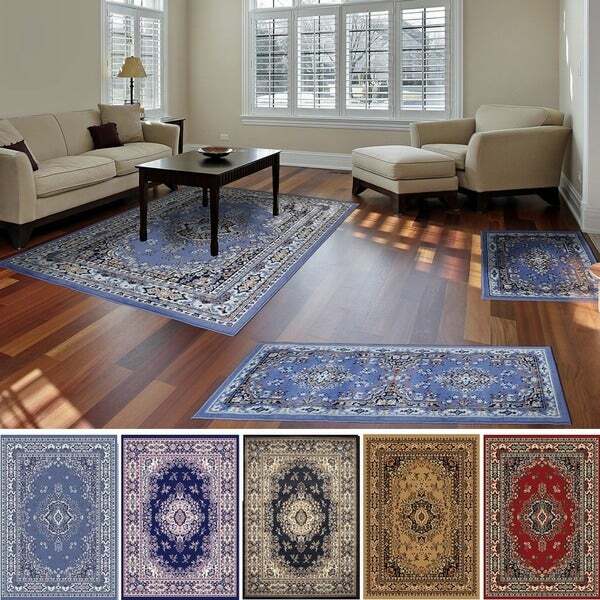 I am currently using them in 2 rooms, and they enhance the décor of both rooms. I would gladly buy this again or at the very least I will buy a similar product like this soon, Can't say enough about this, and the delivery time was fast also. They were the perfect color and size and the quality was great. I understand that colors may be off compared to the pictures but this was totally off. Order the navy and pink rug. It is dark blue and brown. Nothing close compared to the pictures it is showing. These are flimsy rugs yet sturdier than I guessed. They’re perfect for the price and besides moving across the floor like a magic carpet slide, they’re ok with me because at trash time when these get ruined, I won’t cry because the price is fair and they last and last which has shocked me! Oh if they get wet, they curl like a hair! Very thin and cheap. The one corner will no longer lay flat after a year. From the price I knew they wouldn't be high quality rugs but I needed something for the time being. Everything that I have ordered so far has been just as pictured on site,arrived in a timely manner, in great condition. No complaints, good service. Because our home is in they Country my home is all furnished with dark blue furniture & country blue rugs. We are installing new carpet in our living room so I needed new country blue throw rugs & I like the design & the sale price. I like oriental style rugs and this one is an unusual color. Blues are my favorite. "Is it available in an 8x10?" Unfortunately, we do not currently carry an 8 X 10 option. "Can someone please tell me what the difference is between the Claret and Sand contemporary options in choosing this 3 piece set. In particular the Gold.....Im clueless !!! ?" Claret and sand are two different color options. Please click on picture number 2 to see all colors. I hope this helps. "What colors are in the gold pattern rugs." This Sand color option is a gold color with shades of tan, black, white, sage and maroon accents.